Welcome back to new and returning students here at The College of Saint Rose! I cannot believe that our winter break has already flown by. Is it just me or did it feel like you never got a chance to relax? There is something about winter break that makes us want to sleep for a month, but when it comes down to it, none of us can stop the constant ‘going.’ Now that everyone is back on campus and hopefully unpacked, it is the perfect time to evaluate ‘the next step.’ A lot of students will be graduating this semester and will either begin job-searching or applying for graduate school. The Career Center at The College of Saint Rose is happy to help with both of these, as well as many other tasks. 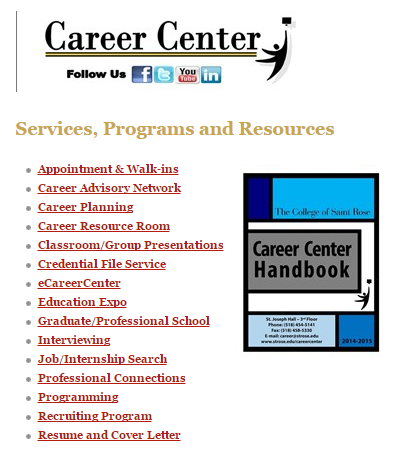 The resources available in the Career Center can give aid to anyone from First Year Students to Graduate Students to Alumni of the college. There is something for everyone and let’s face it… isn’t everyone all working towards the same goal? To have a career? Then why not stop by the Career Center on the third floor of St. Joseph Hall? It certainly cannot hurt to have an updated resume or a little help in the job search process. 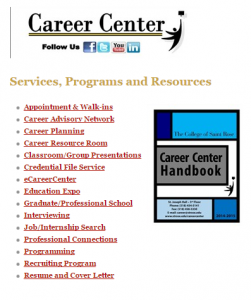 Attached below is a list of many of the services offered in the Career Center. Stop by, contact us, or visit our website for more information!